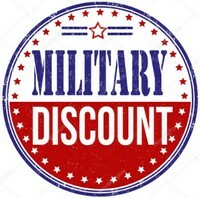 MILITARY members, veterans, and their families can find the best coupons and get cash back rewards from hundreds of leading brands and retailers. Many merchants give from 5% to 20% discounts. At this moment Wow Coupons offers 31 Coupon Codes and 0 Promos for MILITARY Discounts Category. Military: Active Duty, Retirees, Veterans, Military Spouses, Military Family Members. As a proud supporter of military men, women, and their families, Jeulia is happy to offer a 20% military discount on all jewelry.